Tour a 1960s house that includes odes to its past. While living in Brooklyn, Brazilian native and interior designer Ana Claudia Schultz and her husband Aaron Smyle fell in love with upstate New York. They lost out to the house they first set eyes on to cash buyers (now friends) but fortunately, the one next door hit the market shortly after. Circa 1960, the 4,000-square-foot house was on just over an acre in the Hudson Bluffs. 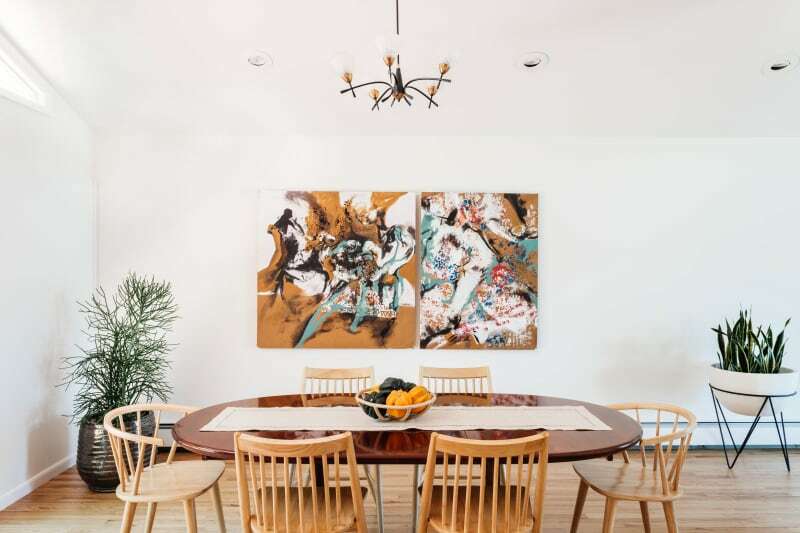 After getting a peek at a few photos only online—enough to show it had good bones—they bought it the same day it was listed “SIGHT UNSEEN!” she laughs. The couple dove into a gut renovation, painting the walls a fresh coat of white and then designing and decorating around the home’s loose interpretation of the mid-century modern style. Rosewood finishes and furniture definitely play into the mid-60s feel, although a slew of other materials and details round out their own style. They sanded and refinished all the wood floors with a matte poly that she chose for being both budget-friendly and timeless, especially because she didn’t want to follow the white stain trend at the time. Tile was a chance to breathe a lot of life into this home. They went with a subway tile in several areas, including the kitchen where a herringbone terra cotta backsplash warms up the white IKEA cabinets. The application is quietly bold while giving a little country rustic luxe and not having everything in the room read so “stark and modern.” Having knocked down a dividing wall to open up the kitchen to the living spaces, the dining room became much more open for entertaining with collected rosewood furniture and lighting from Esty along with her big planters and artwork. The new layout also allowed them to highlight the central fireplace—the showstopper that they designed while looking back to Claudia’s roots for inspiration. “Our first vacation together was to Brazil and Aaron loved Rio. He asked if we could implement the Ipanema floor pattern somewhere in the house and luckily I found that pattern at Cle tile,” she says. The black and white wavy statement pattern is a piece of art in itself and the designer balanced it by adding complementary patterns on nearby pillows and armchairs. Red accents nod to the exterior while blue velvet sofas are a bold choice she felt was both timeless and great for hiding cat hair. Art adds to the lively décor; above one of the sofas hangs framed original floorplans of the house. Even more pattern comes into play in the bathrooms, old and new. The retro bathroom was kept original with orange counters and blue tile, but the master bath got a big makeover with a teak vanity and mirrored cabinets. The couple embraced all things retro and mid-century modern in some areas more than others. The master bedroom features a dresser and nightstands (found at a shop in their old neighborhood Greenpoint, Brooklyn) both in dark wood with strong lines. They look right at home in this vintage dwelling, but Schultz was careful to weave in other elements and styles. “To balance all the mid-century I went for a more classic be, however,r I dislike the typical tufting so we went with a channel tufting.” Inan effort to warm up the woods and gray tones, playful, wild-inspired art hangs above the bed with patterned pillows below. Likewise, the mudroom sports vintage tandem Herman Miller chairs and quirky hooks to hang up winter coats and hats. But instead of adding a modern railing to separate the entry from the mudroom (which is four steps below the ground level), they added a custom, breezy bookcase/staircase design element that’s visible right from the front door. Shultz designed the piece to display their favorite books and houseplants.